Posted by thetickthatbitme in Diagnosis, Peer-Reviewed, TBI Facts, Tick-Lit. Welcome to the second installment of Tick-Lit Tuesday, where I comb through PubMed so you don’t have to. Today’s topic: Babesia and Blood Transfusions. Now, I know I posted about Babesia in the blood supply just a few days ago, but an interesting study has since come to my attention (thanks, Dr. W), and the implications are a bit scary. Okay, get your popcorn and let’s begin. A blood donation pictogram. Image via Wikipedia. It has been well-documented that the tick-borne protozoan parasite Babesia can be contracted through blood transfusions. Blood centers aren’t required to test donated blood for Babesia, but this may change in the future, as Babesia infections contracted through transfusions are on the rise. So if we were to test all donors for Babesia prior to donation, which tests should we rely on to detect this pesky parasite? Let’s look at the candidates. IFA: IFA is an abbreviation for indirect fluorescent antibody test. This type of test can also be referred to as serologic (as in blood serum) testing. If you’ve had one of these tests for Babesia, it’s probably titled something like “WA1 IGG ANTIBODY IFA” (for B. duncani) or “BABESIA MICROTI ABS IGG/IGM” on your lab results. If you’ve had Babesia in the past and been treated for it, your antibody test might still read positive because your body is still making antibodies to the parasite. This is one of the reasons why most insurance companies refuse to pay for treatment for Babesia if your only positive test is the IFA. They think maybe you had a past infection that you got over, so you don’t need treatment. (The other reason they refuse to pay is that they’re jerks, to put it nicely.) I’ll talk more about why this is such a problem later in this post. 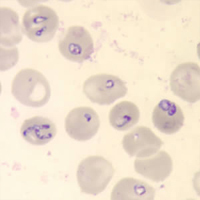 A stained blood smear on which B. microti parasites are visible in red blood cells. (CDC Photo: DPDx). Via CDC.gov. Smear: When we talk about a smear for Babesia, we mean a Giemsa-stained thin blood smear. This test involves looking at blood samples under a microscope to see if there are any parasites hanging around. The problem with this test is that Babesia can infect fewer than 1% of your circulating red blood cells, so it could take many, many smears before any Babesia show up under the microscope. For more information about that phenomenon, read this. PCR: This stands for polymerase chain reaction. It’s basically a DNA test that tries to identify whether a gene associated with Babesia is present in the blood. PCR has been found to be “as sensitive and specific” as blood smears for Babesia (see this study), which is not saying much, considering the tendency of Babesia to go undetected with smears. Can the donated blood of someone with a negative PCR and negative blood smear still be infected with Babesia and cause Babesia infection in transfusion recipients? In May 2008, a 59 year-old California resident (I’ll call him Cal) with sickle-cell disease had some red blood cell transfusions. Cal’s only risk factor for Babesia was the transfusions; he didn’t have any tick exposure. In September of 2008, Cal was diagnosed with a Babesia duncani (WA-1) infection. The parasites were visible on a blood smear, the indirect fluorescent antibody (IFA) test was positive, and the PCR was positive for the Babesia gene. This launched a transfusion investigation in which doctors tracked down 34 of the 38 blood donors whose blood could have infected Cal with Babesia. One donor, a 67-year-old California resident (who I’ll call Don) had a B. duncani titer of 1:4096 (on the IFA test). What does a titer of 1:4096 mean? Well, if the antibody test for B. duncani is negative, the titer will be < 1:256. That means that Don’s antibody test was positive. What the article abstract doesn’t tell you, which the full article does, is that both Don’s PCR and blood smear were negative for Babesia. 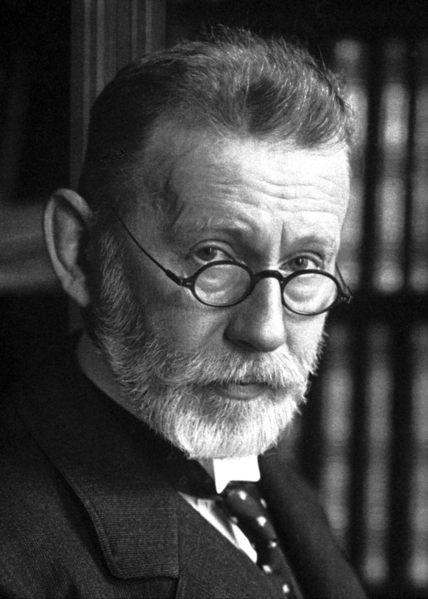 How did the researchers prove definitively that Don had Babesia in his blood? They injected the blood into Mongolian gerbils, and were later able to isolate the parasite from the gerbils. Conclusion: Even though Don showed no symptoms of Babesia and both his PCR and smear were negative, his donated blood caused Babesiosis in both Cal and the gerbils. 1. Clearly, blood smears and PCRs are not good indicators of whether someone is infected with Babesia. Why insurance companies think these tests need to be positive before they’ll pay for treatment is a mystery to me. There are probably a lot of people out there who’ve had positive IFAs but negative smear and/or PCR who were then not treated for Babesia because either the doctor, the insurance company, or both said they didn’t have an infection. 2. As far as the blood donation goes, if we don’t start screening out donors with positive Babesia IFAs, we’re going to continue to contaminate the blood supply with Babesia. It should be as simple as that. Been bitten by a tick? No blood donation for you. Positive IFA? No blood donation for you. 1. Babesia is a parasite that attacks red blood cells. 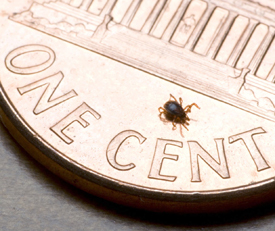 There are three ways Babesia spreads: 1) Through the bite of the blacklegged tick (or deer tick, Ixodes scapularis—the same tick that carries Lyme/B. burgdorferi); 2) Through blood transfusions with contaminated donated blood; 3) From mother to baby during pregnancy or childbirth. 3. Many people who have a Babesia infection don’t show any symptoms. When they do show symptoms, they can include fever, chills, sweats, headache, body aches, loss of appetite, nausea, and fatigue. Some develop hemolytic anemia, which causes jaundice and dark urine. 4. Babesia can be deadly if it goes untreated. Here are some possible complications: low and unstable blood pressure; altered mental status; severe hemolytic anemia (hemolysis); very low platelet count (thrombocytopenia); disseminated intravascular coagulation (also known as “DIC” or consumptive coagulopathy), which can lead to blood clots and bleeding; and malfunction of vital organs (such as the kidneys, liver, lungs, and heart). 5. There are two main treatment options for Babesia: a combination of Mepron and Zithromax OR a combination of Clindamycin and Quinine. Children and women who are pregnant should probably not be treated with Mepron.To read more about treatment, go to the Babesia fact sheet. 6. Babesia is sometimes confused with Malaria because they look similar under a microscope and can have similar symptoms. To avoid confusion, doctors should order multiple types of tests for Babesia if patients show symptoms. To read more about available tests, see the fact sheet. 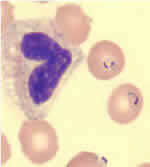 Blood smear stained with Giemsa, showing a white blood cell (on left side) and several red blood cells, two of which are infected with Plasmodium falciparum (Malaria) (on right side). Image via CDC.gov. 7. There are 4 identified species of Babesia that infect humans: Babesia microti, B. divergens, B. duncani (WA-1), and MO-1 (unnamed strain). Antibody tests for Babesia are species specific, so if you have B. microti and you are tested for B. duncani, the test will come back negative. This means that patients need to undergo multiple blood tests! 8. Even though Babesia infection is known to be transmitted through blood transfusion (As of Sept. 2011, the CDC has identified 159 cases, and at least 12 of those people have died. ), donated blood is not tested for Babesia! Donors are asked to fill out a questionnaire asking whether they have Babesia (not whether they’ve had tick bites or Babesia-like symptoms). In other words, we are relying on patient self-reporting to screen the blood supply for this parasite! (Why they don’t screen out all people who’ve had tick bites is beyond me.) The CDC’s response as to whether they will implement testing of donated blood for Babesia in the future: Maybe. They say they are going to “Monitor reports of tick-borne infection to determine if the disease is spreading to other parts of the country and to identify emerging strains of Babesia that may cause human disease.” In other words, they’re going to wait to see how bad it gets before they do anything about the blood supply. Some organizations like the Rhode Island Blood Center have begun screening blood for Babesia using an experimental test, but this is not mandated by CDC policy. This might prompt you to ask: What are my local health department, hospitals, and blood donation organizations doing about Babesia in the blood supply? Have questions or something to add about Babesia? Drop me a comment.